Farmers and Merchants Union Bank, Columbus, WI | ride. travel. live. 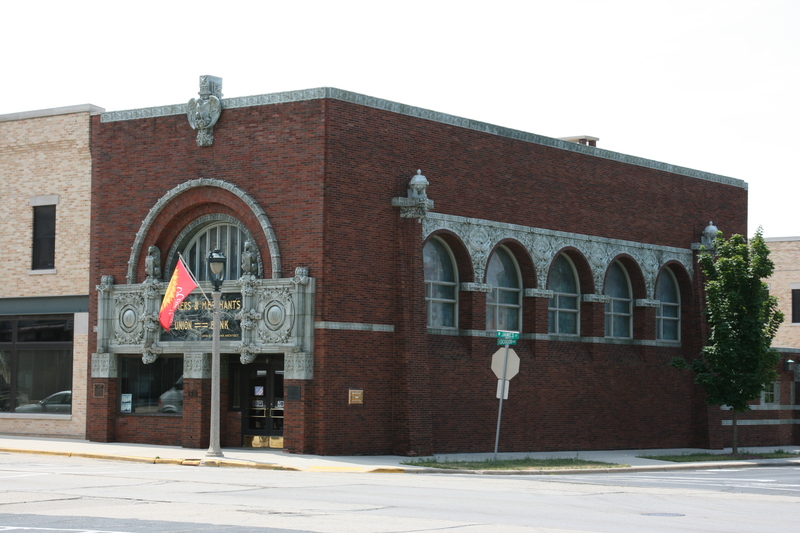 Located 30 miles northeast of Madison is Louis Sullivan’s last completed building (he designed one last facade in Chicago in 1922), his last Jewel Box bank, and one of two structures in Wisconsin. The building remains occupied by the bank that commissioned the work, no small feat in today’s difficult economic times. The building has been very well-kept, and although it has been expanded, the additions have respected the spirit of the original building. A new animal makes an appearance in this final bank, two eagles sitting atop the front and rear elevations, with the Wisconsin state motto, “Forward”. 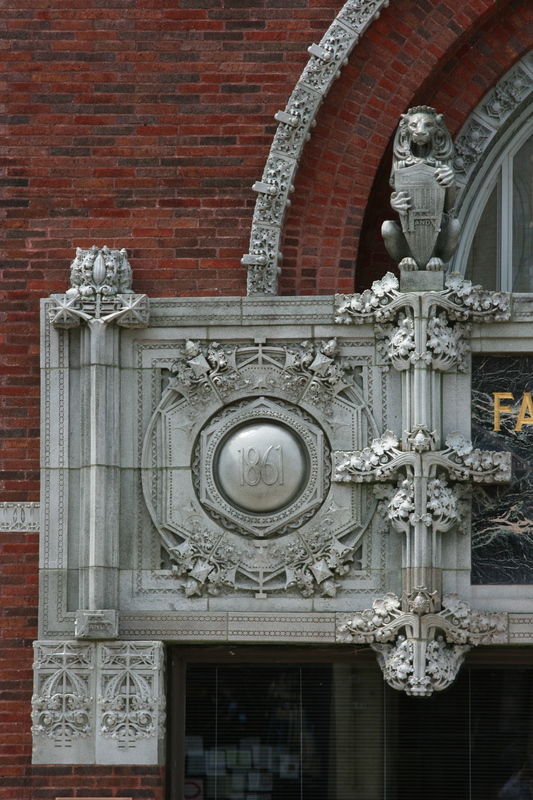 The bank name is on the marble lintel, along with the architect’s name, and the initials are carved in several places in the decorative front, and the gryphons make yet another appearance, holding shields with the F & M logo. Eagle with “Forward”, rear facade. Sullivan’s sketches for the bank survive. The overall plan changed several times, mostly on the front facade. The front facade went from three arches, to a single arch with a centered entrance, before finally settling on the built design. The side elevation, along Broadway (now Dickason Blvd. 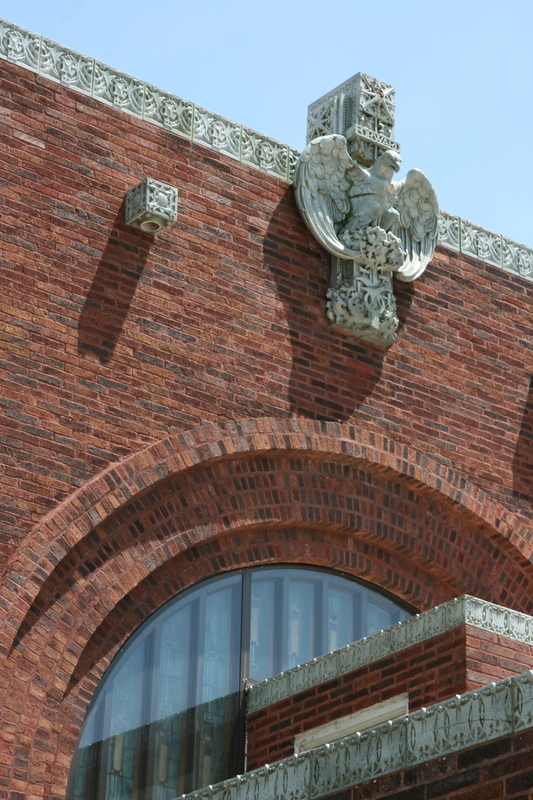 ), was originally seven arches with decorative elements along the brick walls, but Sullivan reduced this to five arches and decoration in terra cotta above the arches. He settled on the final design by the end of March 1919, and the building was opened in June 1920. The inside is similar in plan to his other banks, although with an upstairs mezzanine level holding a small museum of materials and photographs. 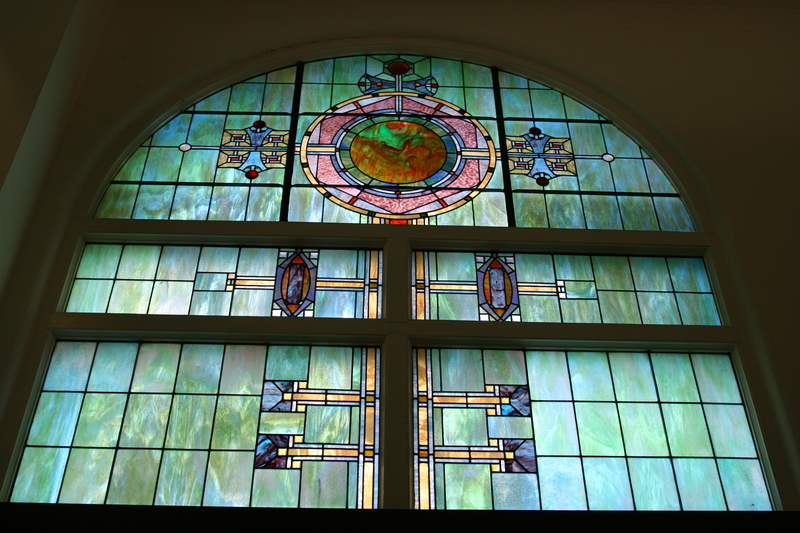 John Szarkowski’s photos of the bank are displayed throughout, as is a Tiffany lamp donated by Sullivan after the bank opened. One nifty, overlooked item is the drinking fountain (bubbler for you Wisconsinites), yes, designed by Sullivan himself. He never neglected the human element of his buildings, his sketches of the facades include people, and the decoration is at all levels of the structure, eye level to keep the passerby interested, and up high to help unify the building.